Ne’imah Jewish Community Chorus (Ne’imah) was founded in 1992 in Albany, New York by Rosemary Linsider, an active member of the local Jewish community. After listening to the Zamir Chorale, the Jewish chorus from Boston and the first modern Hebrew-singing chorus in North America, Rosemary fell in love with the beautiful Jewish choral music that they performed. 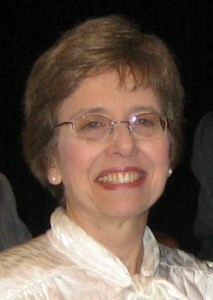 This motivated her to start a similar chorus in the Capital District, which she named Ne’imah Jewish Community Chorus. Rosemary became a chorus member and its voluntary manager for more than 10 years. Rosemary’s dedicated work helped Ne’imah become an important art organization in the Capital District. Neimah has brought beautiful Jewish choral music and renowned guest performers to the Capital District. In 2010, Rosemary moved to Israel. Ne’imah’s board and members strive to keep her dream of bringing Jewish choral music to the area alive. In 1996 Ne’imah became a not-for-profit 501 c (3) corporation, independent from all Jewish or non-Jewish organizations, synagogues or agencies in the Capital Region. Ne’imah’s concerts are of a strictly social nature and are designed to bring the community together. Ne’imah is a volunteer organization. It has two paid contractors: the conductor and piano accompanist, and four volunteer staff: two librarians and the co-presidents/managers. As part of its mission, Ne’imah has acquainted the Capital District Jewish and non-Jewish community with the variety and richness of the Jewish choral music repertoire, ranging from original works written by contemporary Jewish composers to choral arrangements of existing Jewish folk and liturgical music. Over the years, Ne’imah has performed at the North American Jewish Choral Festival, at Friends of Albany Public Library interfaith concerts, the Unity Concert at Hudson Valley Community College, the MOHO Arts Festival at Proctor’s Theater, at Jewish Federation and synagogue events, at Daughters of Sarah Nursing Center, The Massry Residence, and at many other venues in and around the Capital Region. At its concerts Ne’imah promotes both local and out-of-area contemporary Jewish music performers and composers. Ne’imah has performed with renowned performers of Jewish music, such as Zalmen Mlotek of New York, the Zamir Chorale from Boston, Cantor Alberto Mizrahi, Ruth Pelham, Lucille Beer, Jeff Klepper, the Kleine Klezmer Orchestra, Cantor Robbie Solomon of SAFAM, singer/ songwriter Rebecca Teplow, Mak’hela – the Jewish Chorus of Western Massachusetts, Rocapella singer Sean Altman, Jewish Accapella singer Jordan Gorfinkel, Cantor Shira Ginsburg, Cantor Roman Tasat, Peri Smilow and others. In June 2012 Ne’imah celebrated its 20th anniversary by organizing, hosting and sponsoring the first Albany Jewish Choral Festival. Several local choral groups from synagogues from the Capital Region celebrated this milestone together with Ne’imah. It was a very successful event. Ne’imah has received support from the Jewish Federation of Northeastern New York, the Arts Center of the Capital Region and the New York State Council on the Arts, a State agency, the Golub Foundation, and Capital District businesses and individuals.